The Monsters and Mythical Creatures List contain the names of legendary beasts, monsters or massive animals that are based on the stories, myths and legends of the different tribes of Native American Indians that have been brought to life in their stories, dances, ceremonies and works of art. Refer to the article on Mythical Creatures for interesting information about this fascinating subject of Native American Mythology. Many of the beasts found on Monsters and Mythical Creatures List are a combination of two or more animals. An example of this type of mythical creature is the Piasa Bird that is shown in the top picture. The Monsters and Mythical Creatures List contains details of beasts and supernatural beings such as mythical humanoids and beings, flying creatures, water creatures, wolves, mythical animals, winged creatures, sea monsters, sea creatures, birds, dragons, dogs, winged monsters. These beasts feature in the ancient stories of Native American tribes. 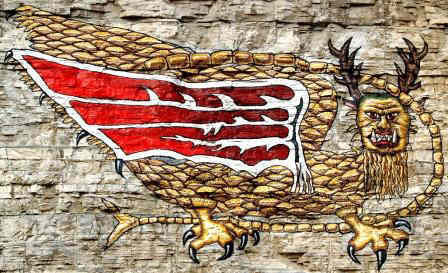 Achiyalatopa: Zuni: Bird: The bird monster has celestial powers, and possesses feathers made of stone knives, which it throws at objects. Tizheruk: Inuit: Snake / Serpent: Large snake-like water creature with a seven foot head and a tail with a flipper. Thunderbird: Various tribes: Giant Bird: A large raptor-like bird usually with curling horns, long legs, a long beak and a featherless head. Underwater Panther: Algonquians, Ojibwe and the Potawatom: Water Monster: Head of a panther, snake-like tail and feet have the claws of a bird of prey.